Sometimes, the NBA obsessed just have to admit that there are times when the game is best viewed through a kaleidoscope. After last night’s mostly clunky Bucks scrimmage against the 3-bombing Timberwolves, one of those times has arrived in Bucksland. Jackson didn’t play last night, Bucks fans have yet to see him play at all with his new team and coach Scott Skiles doesn’t dig headbands. Yet it somehow feels like the Bucks are missing Jackson’s on court aggression already. This entry was posted in The Jinx and tagged Minnesota Timberwolves, Scott Skiles, Stephen Jackson on December 18, 2011 by J.D. Mo. 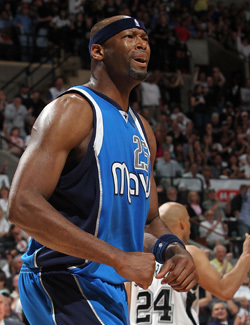 Hoopsworld, CBS and numerous sources reported earlier today that Erick Dampier will sign with the Rockets. This is bad news for the Bucks and GM John Hammond, who had been courting the 6’11”, 35-year-old Dampier to come to the Bucks, badly in need of a back-up for Andrew Bogut. Early foul trouble for Bogut in Minnesota Friday opened up the glass for the T-wolves, who embarrassed fill-ins Drew Gooden, Jon Brockman and rookie Larry Sanders on their way to a 62-39 rebounding advantage. The T-wolves pounded the Bucks for 19 offensive boards and 24 second chance points on their way to a 96-85 victory. That sort of thing doesn’t happen when you have a veteran presence like Dampier taking up 270-pounds of space in the paint. The timing of Dampier’s decision couldn’t be worse. He might as well have lit a dozen flares around the Bucks’ most glaring need. Dampier spent the last six seasons in Dallas, where he blocked over 450 shots and averaged more than 7.5 rebounds per game despite playing less than half time in 356 games. His six-year, $60 million contract expired at the end of last season. The Bucks, the Rockets, Portland, Toronto and Phoenix were reportedly bidding for his services. A sign and trade deal is probably out of the question. This entry was posted in The Jinx and tagged Andrew Bogut, Drew Gooden, Erick Dampier, Houston Rockets, John Hammond, Jon Brockman, Minnesota Timberwolves on October 30, 2010 by J.D. Mo.